Commercial vehicles and trucks account for a large number of road accidents in the US every year, particularly the ones happen on highways. The lawsuits pertaining to any road accident sometimes also depends on the type of vehicle involved. For that matter, we are going to discuss different types of commercial vehicles and trucks in this blog. Commercial vehicles can be differentiated either on their technical classification or the general referencing. On a technical level, commercial vehicles are classified according to a criterion called Gross Vehicle Weight Rating (GVWR). It’s a scale that goes from 1 to 8. Regulators in the US use GVWR scale to put commercial vehicles into different categories. Federal Highway Administration of the Department of Transportation has established Vehicle Inventory and Use Survey s standards for the classification of commercial vehicles according to their GVWR. According to their use and make, commercial vehicles are commonly classified into these types. Flatbed commercial vehicles are the trucks with open and flat trailers used for shipping heavy equipment, machine components, and pipes. These commercial vehicles are usually preferred to transport cargo that can’t be enclosed due to their shape and size. Accidents involving flatbed trucks can turn out pretty bad because of the vehicles non-enclosed nature. These commercial vehicles contain trailers in the form of enclosed vessels used to ship liquids. If the shipment comprises of hazardous liquids such as gasoline, acids, then a special permit is required to put them on highways. Due to the hazardous nature of the cargo, the damages inflicted by tanker accidents can be too many. This type of commercial vehicles has an open container used to ship loose construction material such as gravel, concrete, sand, and stones. Dumpers are also used to carry municipal trash to landfills. Dumpers are mostly involved in backing up accidents since workers work around the back of the vehicle to dump the material. Run-over accidents involving dumpers can’t also be ruled out because they regularly operate in residential neighborhoods. These commercial vehicles are majorly used to transport around nearly all of the cargo that we use as everyday products. Also known as big rigs, these commercial vehicles consist of one or more semi-trailers and tractor units. A specific commercial license is required to drive 18-wheelers. Because of their prevalence on the roads, 18-wheelers are involved in numerous road accidents every year. Due to the humongous weight of a loaded 18-wheeler, it becomes pretty difficult for drivers to overcome the inertia of the vehicle during emergency braking thus result in road accidents. You must have a good attorney on your side if you or your family is dealing with an accident lawsuit involving a commercial vehicle. Always choose a law firm with a history of successful lawsuits regarding vehicular accidents. If you have been in a accident with a commercial vehicle you will need a attorney with a lot of experience and knowledge to defend your rights. 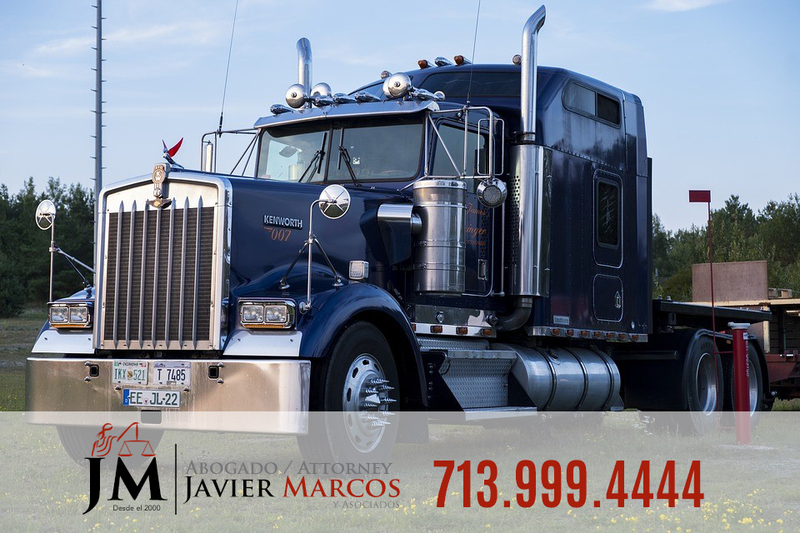 The Truck Accident Attorney Javier Marcos is ready to help you 24/7. Call 24 hrs for a free consultation 713.999.4444. We go to you and no payment unless we win the case.